Soldiers of Alpha Company, 4th Battalion and 10th Special Forces Group move away after exiting a CV-22 Osprey during Emerald Warrior at Cannon Air Force Base. Image courtesy of US Air Force / Tech. Sgt. DeNoris Mickle. A pair of F-16C Fighting Falcons, assigned to the 27th Fighter Wing at Cannon Air Force Base, head out for a mission over Nevada's test and training ranges. Image courtesy of US Air Force / Tech. Sgt. Kevin Gruenwald. An AC-130 Spectre from the 16th Special Operations Squadron flies a training mission at Cannon Air Force Base. Image courtesy of US Air Force / Master Sgt. Jack Braden. 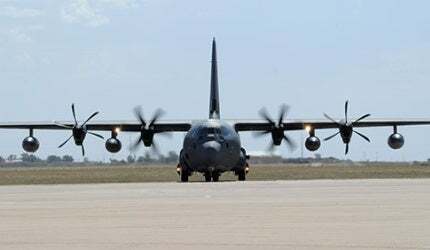 A new MC-130J Commando II taxis on the flightline at Cannon Air Force Base. Image courtesy of US Air Force / Senior Airman James Bell. A CV-22 Osprey with its rotors folded sits in a hangar during a hangar clearance test at Cannon Air Force Base. Image courtesy of US Air Force / Greg Allen. The Cannon Air Force Base (IATA code: CVS) is located 11km south-west of Clovis in New Mexico, US. The base is owned by the United States Air Force (USAF) and operated by the Air Force Special Operations Command (AFSOC). Cannon AFB is spread across an area of 3,789 acres. It employs about 4,153 active-duty members and 684 civilians. "Cannon AFB is spread across an area of 3,789 acres." Cannon AFB’s history began in the late 1920s when Portair Field, a civilian passenger terminal, was set up on the site. Portair was renamed as Clovis Municipal Airport in late 1930s. The airport quickly transformed into Clovis Army Air Base after the United States entered World War II in 1942. The base was renamed as Clovis Army Airfield in 1943 and received the 302nd Bombardment Group – the training unit for B-24, B-17 and B-29 heavy bombers. The airfield was placed on a reduced operational status in mid-1946. The Clovis Army Air Field was inactivated in May 1947. The airfield’s ownership remained in the hands of Air Training Command until being reassigned to Tactical Air Command in July 1951. The base received the 140th Fighter-Bomber Wing, an Air National Guard unit, which reactivated the airfield as Clovis Air Force Base in November 1951. In June 1957, the base was officially named Cannon AFB in the honour of Gen. John K. Cannon. The 474th Fighter-Bomber Group was renamed a tactical fighter wing in October of the same year. The base entered into an agreement with the 27th Fighter Wing in February 1959 and the 27th Fighter Wing was renamed the 27 SOW in October 2007. The Kirtland Air Force Base (Kirtland AFB) is spread over 52,223 acres (21,133ha) in Albuquerque, New Mexico, in the US. The Cannon AFB is home for the host unit 27th Special Operations Wing (27 SOW). The 27 SOW plans and accomplishes specialised and contingency operations as an air force component member of AFSOC. The wing is organised into four groups, which include the 27th Special Operations Group, 27th Special Operations Maintenance Group, 27th Special Operations Mission Support Group and 27th Special Operations Medical Group. The base also hosts other wing staff agencies, including the 27th Special Operations Wing Inspector General, 27th Special Operations Comptroller Squadron, 27 Special Operations Wing Plans and Programs Protocol Office, 27th Special Operations Wing Public Affairs Office and 27th Special Operations Wing Equal Opportunity Office. The Cannon Air Force Base has a single 1,309m long runway surfaced with concrete. The runway can accommodate MC-130W Combat Spear, AC-130H Spectre, MQ-1 Predator, MQ-9 Reaper, CV-22 Osprey and other variants of light and medium transport aircraft. "The Cannon Air Force Base has a single 1,309m long runway surfaced with concrete." The primary training space of the Cannon AFB is the Melrose Air Force Range training area. Sitting on 60,010 acres of land, it is located about 25 miles west of the base. The training range is used for air-to-ground, small weapons and electronic combat training. The training airspace at the Melrose Range is limited to 26,000ft. The nearby training airspace of Cannon AFB extends up to 50,000ft in some areas. The operations are controlled by an air traffic control tower and approach control facility. Melrose supports 4,800 F-16 daily air-to-ground exercises and electronic-combat sorties annually from Cannon AFB, New Mexico Air National Guard at Kirtland AFB and other US and allied forces. Melrose is a primary air-to-ground training resource providing an Electronic Countermeasures (ECM) facility. Supersonic flights at night are disallowed at Melrose, but several units can perform night operations using night vision goggles (NVG), with aircraft remaining illuminated. The Cannon AFB offers six dedicated housing areas in four different locations. The base has two financial institutions with ATMs, convenience store, base exchange, commissary, dining facility, restaurants, film theatre, education centre, child development centres, youth centre and sports facilities.